The Rain Shed Inc. fabric description termanology. Absorbs water and gains weight when wet. Dries slowly providing a cooling effect. Water vapor escapes during activity. Enhances comfort by avoiding a damp, clammy feeling inside garments. Sealed. 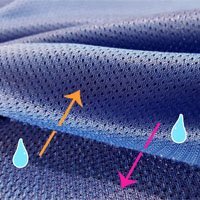 Water vapor cannot pass out of clothing so moisture can build up over time. 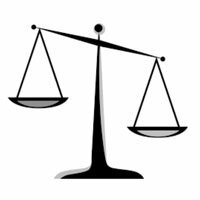 A measure of the weight and diameter of the fiber used in the manufacture of fabric. 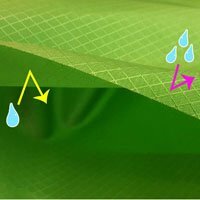 Fibers with lower denier numbers are finer, while those with higher denier numbers are more coarse. 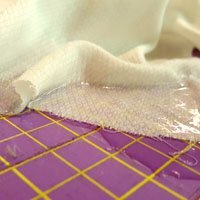 A water-resistance treatment applied to fabric. 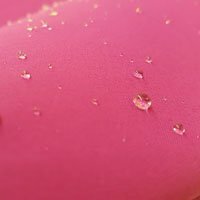 Fabric treated with DWR will cause light rain to bead up and roll off, though heavy rain will eventually penetrate the fabric. 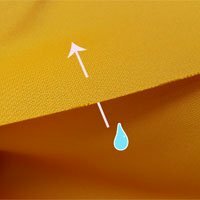 WPB fabrics are composed of a top fabric layer and backed with a waterproof breathable membrane. 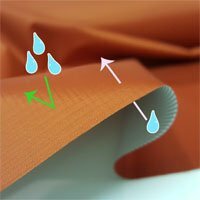 This special membrane allows water vapor to escape the inside of the fabric but does not allow water through from outside to in. Transports moisture away from skin while absorbing very little water. Maximizes comfort inside rain wear despite the inevitable buildup of moisture over time. Worn alone in good weather it minimizes the "cold t-shirt effect" after perspiring.